Hey there (@1979stchristoph), sorry to hear about any frustration this may have caused you; rest assured I’m here to help you find a viable resolution asap! If you’re having trouble uninstalling the Dropbox app, then you could follow the steps outlined on this resource (where it’s mentioned that reinstalling the latest version of the Dropbox can fix the uninstall process). #1. Open the Finder and select Go to folder... from the Go menu (or press Shift+Command+G). #2. A dialog box should appear. #4. To remove your Dropbox application system settings, select all files in the folder and drag and drop them into the Trash. Reinstalling the latest version of the Dropbox can fix the uninstall process: Open Activity Monitor. This utility is usually located in the “Applications” folder, under “Utilities”. In the Activity Monitor, look for lines that say “Dropbox.” Click a line that says “Dropbox.” Click the X to force quit the process. Repeat steps 3 and 4 for each line that says “Dropbox.” Try to uninstall Dropbox again. (Optional) Removing your Dropbox application settings: #1. Open the Finder and select Go to folder... from the Go menu (or press Shift+Command+G). #2. A dialog box should appear. #3. Now copy and paste the following line into the box and press the return key: ~/.dropbox #4. To remove your Dropbox application system settings, select all files in the folder and drag and drop them into the Trash. Would you mind giving my suggestion a go whenever you find some spare time & keep me updated here on the results you’re getting? Thanks & I'm wishing you a wonderful Friday ahead! Thank you for the suggestion but none of this has worked. I have updated my version. Removed all folders and files in the ~/.dropbox folder. Force quit all of the processes within Activity Monitor. Tried to move the Dropbox folder into Trash, but it keeps coming back. I appreciate your cooperation & thanks for taking a bit of your time to try my suggestions (@1979stchristoph). I’d like to dig a bit deeper & have a closer look on your setup through our Official Support channel. So as to investigate having all our tools available, I’ve made sure to reach out to you directly via email. Whenever you find some time, please check your inbox for my message & I’ll make sure to promptly get back in touch with you asap. Happy Monday & I’ll be awaiting your next reply Christoph! 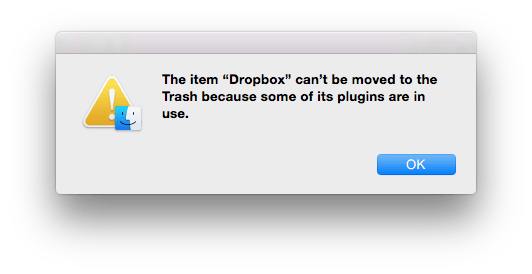 I was having a similar issue and this is what I got: This item "Dropbox" cannot be moved to Trash because some plugins are in use. Even after I unbind the account and delete the folder with the files of my Dropbox storage, it still will not be removed. The situation with Google Drive app for Mac is absolutely the same. Somehow this guide works in my case. Good day! Just a quick update here for posterity, as (@1979stchristoph) was able to remove the application following these steps: He opened up Applications through the Finder Window instead of Launchpad and was able to remove it from there. That did the trick to him (& he asked me to post that here, for others facing the same issue in the future). Happy Friday! [removed by moderation] DROPBOX. What an annoying [removed by moderation] application this is. I am sorry for swearing but [removed by moderation] this application angers the [removed by moderation] out of me. Hey there (@fundrumbone), I understand that being unable to determine why you’re unable to get going with the task at hand isn’t ideal, though I’d like to ask you to keep the discussion civil. For that reason, I slightly modified your post according to our Community Guidelines (which you can review at your convenience). When it comes to your issue you’re facing, could you elaborate a bit on what seems to be troubling you, so as to make sure I’m following-up with you correctly? Thanks in advance!